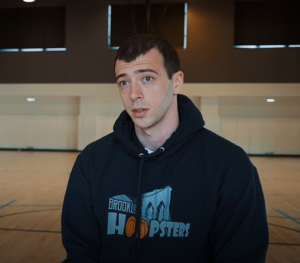 Giorgi (Gio) is the founder of Brooklyn Hoopsters Basketball Academy. Gio, a native of The Republic of Georgia, moved to the U.S. when he was 17 to attend high school and college. He works at the Consulate General of Georgia and founded Brooklyn Hoopsters in 2017. Giorgi was born in Tbilisi Georgia, just before the onset of a civil war with Russian-backed forces. In 1997, when he was only five years old, his uncle got a copy of the movie Space Jam starring Michael Jordan and Giorgi’s love affair with MJ and basketball began. Giorgi and his friends played 24/7 using a wooden basketball hoop. He eventually joined a youth basketball program at the age of seven. By the time Giorgi was 17 he was offered a full basketball scholarship at Mountain State Academy, a prep school in Beckley, West Virginia where his teammates included Enes Kanter (NY Knicks) and Anthony Bennet (the number one pick in the 2013 draft). Giorgi played college ball at Union University in Jackson TN and the University of Minnesota Crookston. After college, Giorgi moved to NYC where he currently works as an economic officer at the Consulate General of Georgia in addition to running the Brooklyn Hoopsters Basketball Academy. What inspired you to found Brooklyn Hoopsters? What in your background prepared you to launch a youth sports company? I played basketball all my life. I have been around great basketball coaches and teams throughout my basketball career. I also studied business management and economics in college, which also helps me to organize and manage my program. How is Brooklyn Hoopsters different from other youth basketball programs? Before I launched Brooklyn Hoopsters, I visited a lot of different programs in NYC to find out what the market was like. There are lots of great programs in NYC and they all differ from one another. Different programs focus on different age groups and skill levels. Some programs focus on competition and traveling around the US, some concentrate on specific skill training. I don’t see myself competing with other basketball programs in NYC. Rather, I try to collaborate with other programs to increase the overall level of youth basketball in NYC. There are so many kids in NYC and demand is always there as long as you offer quality training sessions at an affordable price. At Brooklyn Hoopsters, our goal is to educate our youth about living a healthy lifestyle and active fitness, which will ultimately translate into higher determination for success in basketball and academics. We believe that anything is possible through hard work, determination and dedication. We want to see our kids play high-school, prep-school, collegiate and pro level basketball, but most importantly we want to see our kids become educated and responsible citizens who in the future will add value to our society as a whole. Tell us about the teams you run, the training you offer. Brooklyn Hoopsters Basketball Academy offers different groups based on the age of the student and the level of basketball. So far, we have Team U9 Boys & Girls (elementary level), Team U12 Boys (intermediate level), Team U14 Boys (intermediate level), Team U16 Boys (upper intermediate/advance level) and Team U15 Girls (intermediate level). We believe that assigning a new student to a group that most fits his/her age and the level of basketball is very important for the team and also for the student’s development in basketball. Our goal is to get the most out of every player that joins our academy and we are happy to have an opportunity to offer different groups to a new student that best fits his or her needs. Our 80-minute team workouts offer intensive and individualized training sessions for different age groups. Each group has a different training approach based on their age and skill level. During the sessions, kids participate in activities to develop basketball skills including passing, dribbling, shooting, defense, fun games, team competitions, cardio and stretching. We also do drills to increase our players speed and footwork. Some of our teams also compete in local tournaments around the NYC area. After our sessions, we discuss the importance of positive character traits such as discipline, dedication, sacrifice, hard work, responsibility, and accountability. My goal is to create an environment where kids are happy to come and learn about the game of basketball or get better at playing basketball. Sports should be a fun activity for kids, not something they hate to attend. I look for coaches who can intensify each student’s love for the game. Coaches play a tremendous role in student’s overall development, therefore, everything they do while teaching sports is extremely important. In order to work for Brooklyn Hoopsters Basketball Academy, a coach should be proficient in teaching basketball. Our emphasis is on teaching fundamentals based on the age and skill level of each student. When a student leaves Brooklyn Hoopsters Basketball Academy, we hope he/she has had a good time and has shown improvement. Coaches will have interviews and background checks to ensure they meet our standards. What is your relationship with the Brooklyn Nets? Since we are based in Brooklyn we support the Brooklyn Nets. We attend Nets games during the NBA season where kids have an opportunity to see NBA players, get high-fives, stand beside them during the national anthem, play on the Brooklyn Nets court and get post-game autographs. I believe this is a great motivation for kids to see the highest level of basketball and dream big because I believe dreaming is an essential part of success. What are the particular challenges of doing what you do in NYC? Oh man! Getting courts in NYC is the most difficult part. We are not a non-profit organization, therefore, we do not have access to high-school/middle schools gyms. I got lucky to find our gym at Three Hierarchs Greek Church in Brooklyn, which has a high-quality court and is a perfect location for my program. It is also very hard to find a coach who is dedicated to your program, especially in the early stage. I got lucky to find a dedicated coaching staff that loves what they do and care about our players. I love working with kids. You learn so much about yourself, about life because children help you see things from a whole new perspective. You also learn about child psychology, which is very interesting to me. Every kid is different. They all need a different approach to motivate them, to get the most out of them. In my opinion, if you treat every child the same, you are doing the wrong thing. For me, every day is a great story when I work with kids. The things they say and the things they do are just hilarious. What inspires me the most is when I see our students improve. I also pay attention to each kid how they walk in the gym. What’s their body language? Are they excited or not. When I see happy faces it tells me I have done something right because they are enthusiastic about the practice and that keep me going. Its sounds surprising, but during my freshmen year in college, I lost confidence during the games after all the injuries I went through. I couldn’t make a shot and I was not feeling myself. My coach, David Niven, called me into his office and told me that the only way to gain confidence is to practice. Repetitive practice and training gives you confidence. Confidence comes within the practice and I find that to be very much true. I will always remember that throughout my life. You can be talented, but without hard work, you will never reach your highest potential. Personal responsibility, collective responsibility, teamwork, trust and friendship. These are things that I leaned and possessed that will last lifetime. Right now, my favorite sports book is “Leading with Heart” by Coach K. He is my idol. I hope to meet him one day. I have so many memories related to my sports career, I can’t think of one. But the one I remember is the first open gym I had when I came to the U.S. from Georgia. My English was terrible, I must’ve looked like an alien.